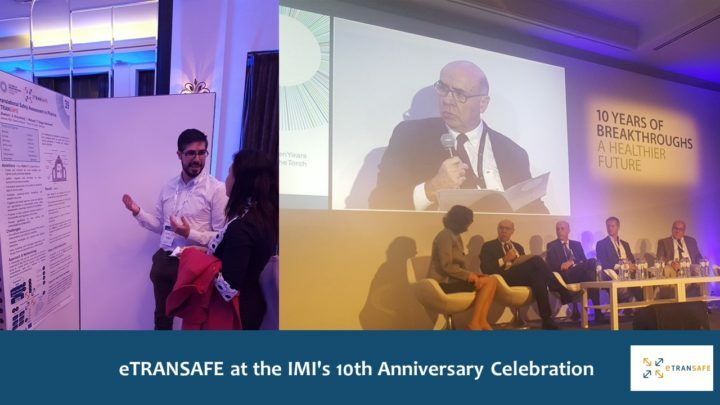 eTRANSAFE was present at the IMI 10th Anniversary Scientific Symposium and the IMI Stakeholder Forum, both events were jointly held in Brussels in the framework of the IMI’s 10th anniversary celebration. The IMI Scientific Symposium was held on the 22nd and 23rd of October 2018 where different scientists from IMI projects presented their achievements through oral presentations and through a poster session. eTRANSAFE was present in this Poster session. Rudd Bueters, from Janssen, presented the eTRANSAFE project through a poster entitled “Translational Safety Assessment in Pharma: eTRANSAFE“. The IMI Stakeholder Forum held on the 24th of October had as theme ’The value of cross-sectoral health research and innovation’. eTRANSAFE Project Coordinator, Prof. Ferran Sanz (IMIM-GRIB), participated in this event and took part in a session entitled “Case study: how to apply Technology convergence in safety “, together with other members from Novartis, Mimetas, Sanofi and GIRP. During this session Prof. Sanz had the chance to introduce eTRANSAFE and to discuss on the benefits of data sharing contributing to the improvement of safety assessment. About the poster session handled by Rudd Bueters at the IMI Scientific Symposium, he concluded: “Many people from diverse backgrounds (industry/clinical/academia) showed interest into the poster presented on the eTRANSAFE and the project was very well received. The symposium attendants appreciated the great ambitions that have been set for the program. The most frequently asked question was: When and how can we get access to the knowledge hub? This clearly illustrated the value of eTRANSAFE to the scientific community. Additionally some visitors were inquiring how they could contribute data to the knowledge hub from outside the consortium. An interesting path to explore further. Overall, the eTRANSAFE project tied in greatly with the ongoing debate throughout the IMI symposium meeting, which was the need of more and better data sharing. The eTRANSAFE project is positioned uniquely to positively contribute to this debate”. In short, make sure that your comments build on rather than repeat material that the adcom can find in your recommendations or college homework writing resume.